FTD is pleased to announce the release of “ELVIS: `WHAT NOW MY LOVE”. 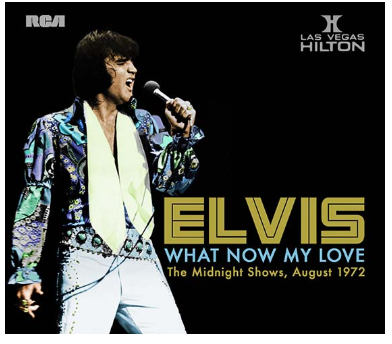 Released as a 5” digipack, this 2-CD set features Elvis in great form from his legendary Vegas shows in August 1972 at the Hilton Hotel, Las Vegas. WHAT NOW MY LOVE consist of the midnight shows on August 11 and 12. Between Madison Square Garden and Aloha From Hawaii, the ELVIS PRESLEY SHOW was at its peak! Elvis is in top form with both new and old songs in his repertoire, and especially with the addition of 3 great new songs, “What Now My Love,” “Fever” and “My Way.” In an effort to find the right style for each arrangement, Elvis totally commits himself to each performance. The opening lines of “What Now My Love” will send thrills down your spine! The shows are in above average ‘soundboard quality’ but unfortunately the ending is missing from the second show.